‘WOW – WORLD OF WONDER’ POSTPONES OPENING DATE AT RIOT: The international circus-style production “WOW – World of Wonder” will now make its North American debut at the Rio Showroom Oct. 3 instead of Sept. 26 due to construction delays. In preparation, the showroom is being transformed into a world of water with a custom-built stage and pool. GERTIE, THE GIMP IN A BLIMP, JOINS ‘ABSINTHE’: The raucous cast of “Absinthe” at Caesars Palace has a new act, Gertie, The Gimp In a Blimp. Since the show’s debut in 2011, a string of showgirls have cavorted with the giant weather balloon. Continuing to push boundaries and the wild side, Gertie exhibits her flexibility and jaw-dropping sensuality in strips of black PVC. ‘AMERICA’S GOT TALENT LIVE’ ADDS SHOWS AT PLANET HOLLYWOOD: “America’s Got Talent Live” added two extra shows on Thursday, Nov. 2 and Sunday, Nov. 5 at 7:30 p.m. to its Nov. 3 and 4 booking in the PH Showroom at Planet Hollywood. The show will be headlined by singing ventriloquist Darci Lynne (Farmer), the Season 12 winner of NBC’s “America’s Got Talent.” In 24 hours, Lynne’s audition video garnered 105 million Facebook views, and within 30 hours of the broadcast she became the most socially viewed AGT performer in series history. Lynne will be joined by Season 12 finalists singer Angelica Hale, dance group Light B alance, and comedian Preacher Lawson. Ticket range is $55 to $185. 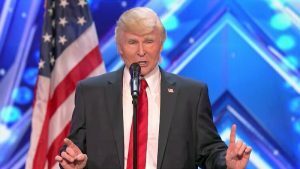 THE SINGING TRUMP VISITS THE JOINT AT HARD ROCK: The Singing Trump portrayed by singer, impersonator and comedian Jeff Tracta from Season 12 of NBC’s “America’s Got Talent,” will headline a night of singing, laughing and dancing at The Joint inside Hard Rock on Saturday, Nov. 4 at 8 p.m. Tickets start at $45.45. Tracta first earned fame starring as Thorne Forrester for eight years on the CBS daytime drama “The Bold and the Beautiful.” His musical talents manifested on the soap. He has performed concerts in more than 31 countries and albums go triple platinum worldwide. Tracta also made his Broadway debut starring as Danny Zuko in Tommy Tune’s revival of “Grease.” His award-winning comedy performance in “Agency” received rave reviews and won the Los Angeles Critics Choice Award. TAPE FACE IS BACK AT THE FLAMINGO: Tape Face, another “America’s Got Talent” sensation is back for a sophomore residency and limited-engagement at Bugsy’s Cabaret at the Flamingo, Oct. 1, 19-22, and Nov. 1-5, 8-12, 15-19. Tickets begin at $62.95. The mime artist Sam Wills is a former circus and street performer in his native New Zealand. He has been presenting his progressive silent whimsical stand-up since 2008. Tape Face recently finished his seven-week debut at the historic Garrick Theatre on London’s West End. ‘LEGENDS’ FALL LINEUP TURNS BACK TIME WITH ‘THRILLER’ CAST: Celebrating 34 years, “Legends in Concert,” Las Vegas’ longest-running show, keeps the show fresh with an ever-changing lineup. Through Nov 19, the celebrity mix highlights legendary music luminaries Cher, Frank Sinatra, Elvis Presley and Michael Jackson at the Flamingo. 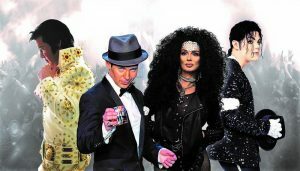 Living legend Cher portrayed by Lisa McClowry can “Turn Back Time” while the Halloween spirit is represented with Damian Brantley’s version of Michael Jackson’s “Thriller.” Brian Duprey brings Frank Sinatra’s vocals to life and the King, Elvis Presley, is manifested by Kevin Mills. It’s important to remember the performers sing live and are they backed by a live band and dancers, which makes for a winning combination. LINDA SUZANNE DEBUTS NEW DIVAS OF POP SHOW AT SOUTH POINT: Linda Suzanne will debut her new show “Linda Suzanne Sings Legendary Divas of Pop” with a special guest appearance by artist Paul Shortino on Sunday, Oct. 15 in the South Point’s showroom at 6 p.m. Tickets are $30 and a portion of the proceeds will be donated to Las Vegas’ Friends for Life Humane Society. Some of the legendary artists Suzanne will honor include: Donna Summer, Adele, Gloria Estefan, Whitney Houston, Gladys Knight, Dusty Springfield, Linda Ronstadt, Connie Francis and other trailblazers. Suzanne’s show will feature a five-piece band, dancers and backup singers. 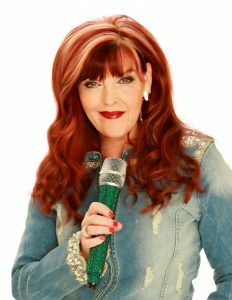 Suzanne began her career as a teen opening for such legends as Rosemary Clooney, The Righteous Brothers, Joni Mitchell, Leon Russell and Ricky Nelson the night of his fatal plane accident. JERRY’S NUGGET WILL OPEN NEW PIZZERIA: Jerry’s Nugget in North Las Vegas is revamping the closed Uncle Angelo’s Pizza Joint and replacing it on Sunday, Oct. 15 with Contento Pizzeria and Bar specializing in gourmet pizzas and pastas made in an authentic Italian style led by two pizza specialists from Florence, Italy, Carmine “Giuseppe” Conte and Ismaele Romano. Contento will feature an extensive wine list with a fine selection of 50 wines under $100. Hours will be 11:30 a.m. to 10 p.m. Sunday through Thursday and until 10:30 p.m. on Friday and Saturday. The lounge and bar’s Happy Hour will be Monday through Friday, 3-6 p.m. and 9 p.m. to closing, with wine by the glass and signature cocktails for $6 each. Mondays a bottle of wine will be half off. For a quick meal, Contento To-Go will be located alongside the dining restaurant. MCCORMICK & SCHMICK’S CLOSES TO BECOME A CLAIM JUMPER: In a sudden move, McCormick & Schmick’s at Hughes Center closed on Sept. 23 with plans to re-open right away as a Claim Jumper, replacing the one closing at Town Square. Both restaurants are part of the Landry’s Inc. chain of eateries. McCormick’s as it was called by most devotees debuted in 1998. 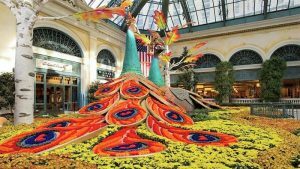 BELLAGIO’S CONSERVATORY HARVEST DISPLAY EMBRACES AUTUMN: The newest Bellagio Conservatory & Botanical Gardens display running through Nov. 25 envelops the autumn season with enchanting landscapes featuring two exotic flower-encrusted 19-foot peacocks and mystical creatures. The East Garden has a 25-foot circular dome draped in gold and burgundy vines and four ornate chandeliers while the South Garden features a 28-foot enchanted talking tree and three scarecrows. The conservatory is open to the public 24 hours daily and free. 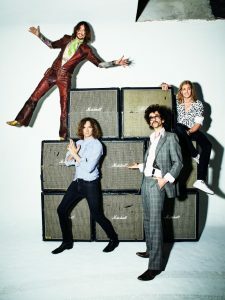 THE DARKNESS DESCENDS ON BROOKLYN BOWL IN 2018: British glam metal outfit The Darkness is bringing its Tour de Prance to Brooklyn Bowl at The Linq Promenade on Friday, March 30, 2018, at 7 p.m. General admission tickets start at $25.The hard rock quartet formed in Suffolk, England, in 2000 and gained extreme international popularity and acclaim with the release of 2003’s “Permission to Land,” highlighted by the single, “I Believe In A Thing Called Love.” In 2005, “One Way Ticket To Hell…And Back,” included the Top 10 hit “One Way Ticket.” The Darkness is set to release their fourth studio album, “Pinewood Smile,” on Oct. 6 and have been touring Europe with Guns N’ Roses. The Brooklyn Bowl stop will be the second on the North American leg of the tour. NINE INCH NAILS WILL ROCK THE JOINT: Rock band Nine Inch Nails will bring their explosive live set to The Joint at Hard Rock on Friday, Oct. 20. Nine Inch Nails’ new EP “Add Violence” is now available to stream or download and is the second in a trilogy of EPs, following 2016’s “Not The Actual Events.” Tickets start at $79.50. The band’s sold-out July 19 show at Bakersfield’s Rabobank Arena marked their first live performance since 2014 and kicked off their summer of major festival headline performances. NOSTALGIC DREAM AWARDS WILL BE HELD AT SUNCOAST: Harrison Entertainment Group will be hosting “The Dream Awards” on Sunday, Oct. 22 at 8 p.m. at the Suncoast. The award show will recognize entertainment trailblazers, influencers, and innovators who paved the way for others in Las Vegas. Tickets start at $29.95. 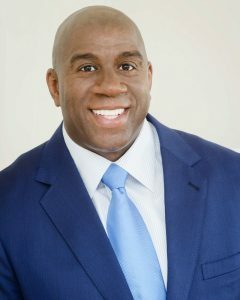 The Dream Awards will be hosted by acclaimed actor and director, Antonio Fargus and KNTV Action News Anchor, Tricia Kean. Honorees include: Lifetime Achievement Award Recipient, 5th Dimension singer, Lamonte McLemore and Visionary Award Recipient, Kathie Spehar. Other honorees are: Sonny Turner, Gregg Austin & Second Wind, Sonny Charles, Earl Turner, Janis Carter, Darcus, Dondino, Loretta Holloway, Next Movement, Tony Tillman, Jeneane Marie, Denise Clemente, Freddie Empire and Copeland Davis. 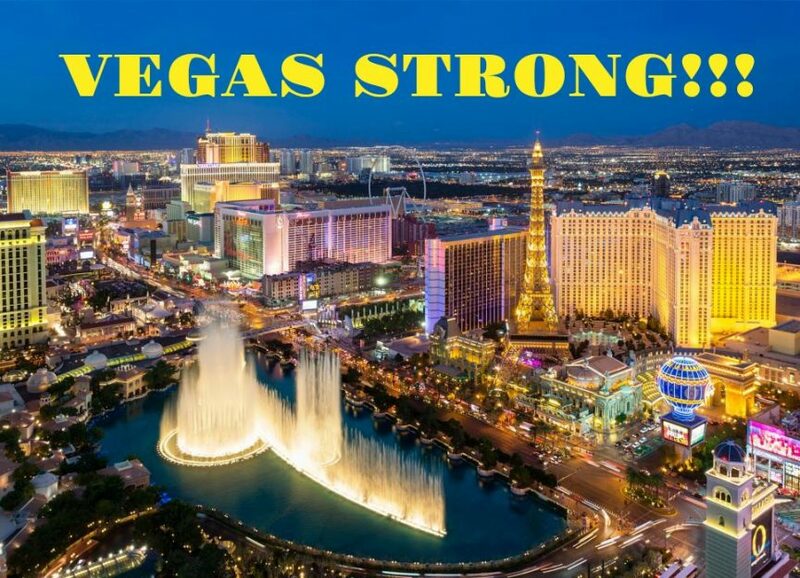 The “Today Show” will film again and broadcast live in Las Vegas on Friday, Nov. 3 and will tape an additional show to air Nov. 6 with hosts Kathie Lee Gifford and Hoda Kotb. Following two-night Las Vegas performances, legendary rock and roll band REO Speedwagon will unveil its first dedicated memorabilia case at Hard Rock Hotel on Monday, Oct. 2 at 1:30 p.m. NBA legend and two-time Hall of Famer Earvin “Magic” Johnson will deliver a keynote address at the world’s largest casino-gaming event, the Global Gaming Expo (G2E), presented by the American Gaming Association (AGA) and Reed Exhibitions, on Thursday, Oct. 5 at 9 a.m. The 17th annual Las Vegas BikeFest, which is a glitzy and gritty Vegas-style motorcycle rally, showcases the hottest choppers, hogs and speed bikes under the neon lights. The four-day event features rides and rallies, appearances by celebrated motorcycle icons, demo rides, live musical performances from hard rock acts, a poker run and more. Las Vegas resident and transcontinental runner Helene Neville at age 56 finished her seven-year, 12,955-mile solo run across every state in the continental United States, becoming the first and only woman and only the second person on the planet to accomplish this feat. When she recently arrived at the Westgate’s main entrance, she was greeted by fans, staunch supporters, along with the stars and headliner Jennifer Romas of the resort’s “Sexxy” show. The free How to Grow Fresh, Organic Produce in Las Vegas Festival will be held Saturday, Oct. 7 from 10 a.m.-4 p.m. at Vegas Roots Community Garden, 715 N. Tonopah Drive. The full day will feature activities and entertainment, food, urban gardening and farmers leading workshops and demos, etc. It will be Fossil Day at the Natural History Museum on Oct. 14 from 10 a.m.-3 p.m. with a student art contest and award ceremony, fun fossil activities, and more! The Home Improvement and Landscape Expo, featuring appearances from Bristol and Aubrey Marunde of HGTV’s “Flip or Flop Vegas,” will take place at the Orleans Arena Oct. 6-8 starting at 10 a.m. each day. 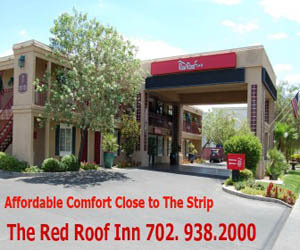 The three-day expo offers the latest products and services for home remodeling and decorating. Admission for adults is $5. Seniors and military members are free on Friday. At the Mob Museum, “Courtroom Conversations: The Digital Underworld: Cracking Down on Cybercrime,” will be held Thursday, Oct. 5 at 7 p.m. One of the FBI’s top national authorities on cybercrime will join experts in the field of cyber security and information technologies for a comprehensive and compelling panel discussion exploring organized crime in the virtual world. Cost is $25 with 10 percent discount for museum members. The High Roller Observation Wheel is being lit pink for one hour each night starting at 6:30 p.m. until Oct. 6 in honor of breast cancer awareness. Chateau Nightclub & Rooftop at Paris will host a throwback Halloween bash ‘80s-themed party starting at 9 p.m. on Friday, Oct. 13. Guests are encouraged to dress in ‘80s attire. The 25th Annual Pahrump Valley Winery Grape Stomp will be held Saturday-Sunday, Oct. 7-8 from 11 a.m.-4:30 p.m. featuring vendors, food, live music, wine tasting, and grape stomping. Admission is $10. FOUR PRE-BOOK FESTIVAL EVENTS ARE PLANNED: Four free Las Vegas Book Festival pre-events are set for Oct. 10-20. First are author Mac Barnett and author/illustrator Jon Klassen with the release of their latest picture book, “The Wolf, the Duck and the Mouse,” with a presentation and book signing Tuesday, Oct. 10, at 6:30 to 8 p.m. at the Historic Fifth Street School. Next, the Las Vegas Writes Project will launch this year’s book “Back to Where You Once Belonged: Las Vegas Writers Weigh the Power of the Past” with a conversation with the authors Thursday, Oct. 19, at 7 p.m. at the Clark County Library Theater at 1401 E. Flamingo Road. Friday, Oct. 20, there will be two events. From noon to 2 p.m., the College of Southern Nevada and The Center of Las Vegas will host an afternoon with author Nicole Dennis-Benn at Las Vegas City Hall in Room 3310-A. From 3 to 4 p.m., author Brit Bennett will discuss her debut novel “The Mothers” at the College of Southern Nevada North Las Vegas Campus in Building C, Conference Room A 2638. The best-selling novel was recently optioned for film. Burgerim, an international franchise operating more than 200 locations in16 countries, opened its first location in Las Vegas last week locally at 9635 Bermuda Road and another location will open soon at 7645 S. Rainbow Blvd, Suite 100. The incredibly fast growing casual restaurant chain is known for gourmet mini-burgers with 11 different meat options and nine custom toppings. Each restaurant is independently owned and managed by franchisees. Blue Martini at Town Square just celebrated its 10th anniversary. Blue Ribbon Fried Chicken at Grand Bazaar and in Downtown Summerlin is introducing the Boo! Bird sandwich with a ghost pepper BBQ sauce drizzled atop Blue Ribbon’s signature fried chicken. To launch the new sandwich, guests can participate in a Trick-or-Treat costume Instagram challenge to win a complimentary sandwich for November. Lakeside restaurant Americana Las Vegas in the Desert Shores community starts a new Sunday Soirée offering half-priced bottles of champagne and sparkling wines every Sunday starting at 4 p.m. 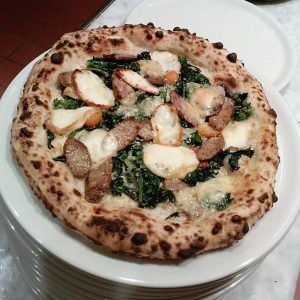 While National Sausage Pizza Day is Oct. 11, Pizza Forte at Sunset Station and Hard Rock Hotel will celebrate all month long Oct. 1-31 with its new fall dish Potato and Sausage pizza. EPICUREAN CHARITABLE FOUNDATION’S fundraiser is M.E.N.U.S. EVENT: The Epicurean Charitable Foundation’s (ECF) dine-around event Mentoring and Educating Nevada’s Upcoming Students (M.E.N.U.S.) will be held at the Hard Rock’s Paradise Pool Friday, Oct. 13 from 8-11 p.m. Tickets for the fundraiser start at $500. M.E.N.U.S. will feature more than 50 top restaurants, chefs, mixologists and beverage distributors, as well as a performance by headlining band Everclear and DJ set by this year’s honoree Chef Hubert Keller. The renowned chef acquired DJ skills from his friend, San Francisco-based DJ “Frenchy le Freak,” who received cooking lessons from Keller in return. 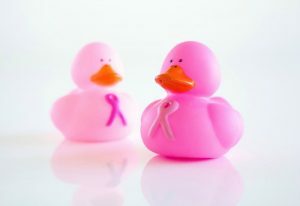 To support National Breast Cancer Awareness Month, The Forum Shops at Caesars Palace is holding its first “Ducks For A Cure” fundraiser to benefit the Susan G. Komen® Foundation. For $5, folks can adopt a pink duck at either Guest Services Booth, even write a message on their new buoyant buddy, and release it in the reflecting pool at the base of the spiral escalator on level one. 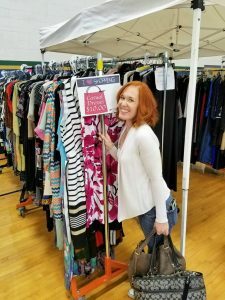 The Dress for Success Southern Nevada fundraiser will hold its semi-annual, two-day “Shop for Success” excess inventory sale again at Spring Valley High School on Saturday, Oct. 7 from 9 a.m. to 4 p.m. and Sunday, Oct. 8 from 10 a.m. to 2 p.m. On Sunday, shoppers can buy a shopping bag for $25 and fill it.